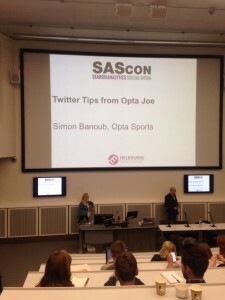 The session that most caught my eye when looking at the day one schedule for SAScon was the talk from Simon Banoub, director of marketing at Opta Sports. 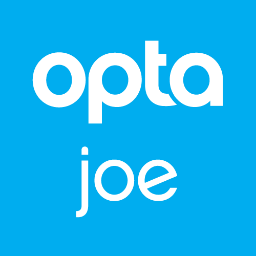 Anyone who’s into football will no doubt follow the various Opta accounts, with @OptaJoe leading the way with regard to stats and facts. Hey, Joe, where you goin’ with stat fun in your hand? Simon gave us an overview of how Opta collect their masses of data, with students who are good at video games apparently the most adapted to watching live games then plugging the data in. What a job, eh? Opta collect thousands of pieces of data each game to create their stats and facts, with a range of B2B clients to sell into. This ranges from gambling firms, sports clubs and news agencies amongst others. These are then used in sport graphics on TV, mobile aps, sponsorship campaigns and analysis in newspapers. It really is a huge business for something so simple as what happens on a football pitch! Opta knows its audience on social is composed of sports fans. In order to segment these fans they created the “family” of accounts with Joe on football, Jonny on rugby and Jim on cricket. Following on from feedback from foreign fans they created a range of localised accounts (Jean, Javier, John, Juan and Paolo in Italy). You can see their branded theme, mostly, throughout. Opta also have a range of business accounts for their own sales and marketing. Number > fact > summary > word. Simon even mentioned the (just as famous) OptaParody and OptaJoke accounts which have imitated their style! Whilst he said that this initially frustrated him, he said it has actually helped spread their brand across the world and increased sales. Opta staff are asked to join in the conversations on Twitter. They’re also encouraged to show they’re proud that they work for Opta by featuring the fact in their bios. Simon described how this helps their brand appear fun and easygoing to work for. Despite this, the front page of a social media guidelines document was shown, so there are always limits! Simply tweet often, and make it interesting to your audience! Opta are great for pushing out facts and stats in real time, with tweets ready to go as soon as an event has happened. This also involves them utilising their schedule to fit in with when their followers are online. Players like Gary Lineker and Rio Ferdinand with huge followings on Twitter are easy targets to tweet at, so players are often mentioned where possible. Quite simply Simon showed us the wasteland of their Pinterest page, which they quickly realised was not the channel for them. Simon covered how they run sessions such as #askOpta and other regular quizzes they do to find more ways to engage with fans. In the early days OptaJoe didn’t pick up too quickly, with the company getting itchy feet. The sales staff thought that giving away free content was hampering their efforts! However, they kept patient and saw the results with big brands wanting to get involved, and so the whole social media approach eventually paid off; though this meant pushing back early on on getting sponsorships for the OptaJoe account. 10. Be interesting. Or helpful. Or offer an insider’s perspective. Simon described how Twitter offers insight from people you trust, information from those who are cleverer than you and fun stuff from people who have more access than you. Opta wanted to try and be one or more of those and have succeeded. Other tips Simon mentioned were to only retweet appropriate stuff from appropriate people, again meaning pushing back on sales people. They also don’t use hashtags! He says they have no reason for them (#interesting). In terms of results they get around 20k retweets a week and 1,800 mentions from tweeting around 65 times a day. This has helped Opta itself to quadruple its turnover in the last four years with inbound sales leads up 760% in that time. This has seen them become the official data provider for most of the top leagues and competitions in the world. The summary was that OptaJoe has helped transform their company. They’ve had fun incidents such as Joey Barton hitting out at their stats (shock) until they invited him in and he tweeted a picture of them as friends, and became yet another brand ambassador! There were a few questions at the end but all round it was a great insight from Simon about OptaJoe, with some valuable social media tips for any ambitious brand to take away!